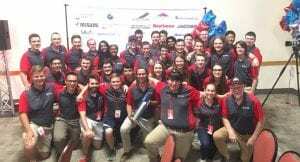 The Buckeye Space Launch Initiative has soared to first place at the Spaceport America Cup for two years in a row, winning the 30k solid-engine Student Researched and Designed (SRAD) category in June 2017 and the 10k solid- SRAD category in June 2018! The Spaceport America Cup is designed around the Intercollegiate Rocket Engineering Competition (IREC) for student rocketry teams from all over the globe. Each year, the competition attracts well over 100 teams from colleges and universities around the world. Teams of students design, build and launch solid-, liquid- or hybrid-fuel rockets to a targeted altitude and are judged on how close they come to that target, as well as on the merits of the rocket’s design, construction, and scientific payload. This past summer, over 30 BSLI members traveled to Truth or Consequences, New Mexico, to represent Ohio State at this competition. They launched three rockets – the 30,000 ft. apogee “OH” rocket, the 10,000 ft. apogee “IO” rocket, and the experimental two-stage high-altitude rocket “Biggie Smalls” – more rockets than any other team at the event! 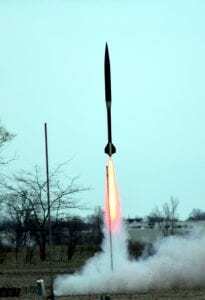 The IO rocket, competing in the 10k solid- SRAD category, took home first place this past summer, hitting an apogee of 10,109 ft, a mere 1% off the target altitude. 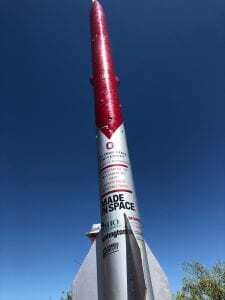 This year, the Buckeye Space Launch Initiative will once again be working on three separate projects. The 30k “OH” team and the 10k “IO” team will continue iterating on their designs and building better rockets than ever before. The third team is called the High-Altitude Project (HAP), and it is the successor to last year’s 100k project. They will pushing the boundary of university rocketry by competing in the Base 11 Space Challenge, aiming to launch a rocket to reach beyond the Karman Line – that is, above 100 kilometers and into space – by the end of 2021. This would cement BSLI as the first student-led university team to ever reach outer space. The following is on-board footage from a BSLI test rocket that was launched to 10,000 ft! 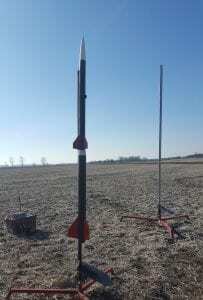 To learn more about our three rocket design projects, follow the links below. Get Added To Our Email List!! Want to make a gift or donation to support the team? Click here!